Difillobotrios (synonym bothriocidaris) is a parasitic infection caused by a large tape worms belonging to the genus Diphyllobothrium. The most widespread and Diphyllobothrium latum - lentets wide (Fig.). His body can reach a length of 7 to 9 m and consists of a set of segments, each of which has independent system of male and female sexual organs. At the head end are two deep cracks (botei), with which the parasite is attached to the host tissues. 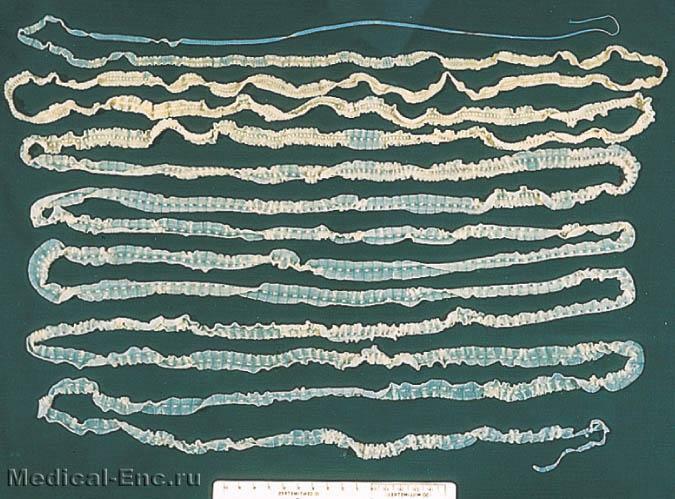 Adult parasites in the small intestine of humans, cats, dogs and wild animals. After fertilization, they start to produce eggs released out with faeces owner. Eggs develop only in fresh water. From the egg leaves covered with cilia larva (koratsidy), which, being swallowed copepods crustaceans-Cyclops, develops in his body the larvae of the second stage - protecode. Further development of protecode occurs in fish, proglatyvayushchiy cylinder together with the Cyclops. Predatory fish may also become infected by eating smaller fish containing larvae. In the body of the fish larvae reach invasive stage (plerocercoid). They are located in the muscles and on the surface of the internal organs. Ingestion plerocercoids man and other final hosts after 18-20 days in their body develop adult parasites. Epidemiology. Pockets of difillobotrioz are located near freshwater bodies. In the centers near small lakes are affected population are usually higher than in the centers, located near major rivers. In the USSR the pockets of difillobotrios are concentrated mainly in the basin of the Ob, Irtysh, Lena, the Yenisei, the lower stretch of the Amur river, Svir, Pechora, the Neva river, in the Lower Volga, at lakes Baikal, Ladoga, Onega. Person contracts difillobotrios, eating poorly cooked (cooked or raw fish (pike, burbot, ruff, perch), in tissues which are larvae lentetsa wide. Especially often larvae fall with a fresh, slightly salted caviar pike and burbot. Infection often seasonal in nature and confined to spring Putin. Distribution of invasion largely depends on unsatisfactory San. the status area and water pollution faeces in the discharge into the water untreated or poorly treated sewage, discharge of sewage from ships and other types of river transport, leakage of fluid from cesspools, during mass bathing, washing of linen, etc. Pathogenesis. Lentets wide has on the host organism sensitizing and mechanical effect. In some cases, it causes anemia pernicious type, which is based caused by a parasite, the metabolism of vitamin B12 and folic acid. In development of anemia are important condition of an organism of the patient, the nature of its food, living conditions. The clinical picture. Difillobotrioz often takes place at a brightly expressed symptoms: weakness, dizziness, drowsiness, nausea, vomiting, abdominal pain, diarrhea or alternating diarrhea and constipation. Often the language appear bright red painful spots and cracks. Developing ahilia, chair unstable, liver and spleen enlarged. In the blood - megaloblastic, occasionally normoblast, aniso - and poikilocytosis and polychromatophilia. Color indicator is high. The diagnosis is based on detection of eggs lentetsa in the faeces (see Helminthological research methods). Treatment of difillobotrios specific and pathogenetic. In severe cases of anemia pathogenetic therapy should begin to deworming. Intramuscularly vitamin B12 on 100-200 micrograms a day for 3-4 weeks, in the first week of every day, then every other day. Specific therapy is fenasalom appointed by a single dose of 2 g (children of 0.5-1.5 g) in 1/4 Cup of water at night, or Dalacom (2 g fenasala +1 g dichlorophene) by the same method. Effective ether extract of rhizomes male fern adult dose of 4-5, an hour after reception of a fern - saline laxative, in 1-2 hours after a laxative - light Breakfast. If contraindications (cardiac decompensation, ulcer processes in the gastrointestinal tract, liver disease and kidney failure, pregnancy) designate pumpkin seeds or Akrikhin. Prevention of diphyllobothriasis is through the protection of water bodies against pollution (see Sanitary protection of water bodies), mass treatment of infested, health education.